A thoughtful, warm, and witty introduction Understanding the Bible is designed to help empower skeptics, seekers, nonbelievers, and those of a liberal and progressive outlook to reclaim the Bible from literalists. In making accessible some of the best contemporary historical, literary, political, and feminist readings of the Hebrew and Christian scriptures, it encourages all who would find in the biblical heritage an ally and not an enemy in the quest for a more just and humane world. Brief and to the point, it can easily be used to stimulate group discussions and personal reading of the biblical texts themselves, and is an excellent introduction to the Judeo-Christian tradition for those of other faiths. Understanding the Bible includes four preliminary chapters on the why, who, which, and how of biblical understanding, followed by eight brief thematic chapters covering the core of the Hebrew Bible and six covering the Christian scriptures, plus chronologies, maps, and helpful suggestions for further reading. 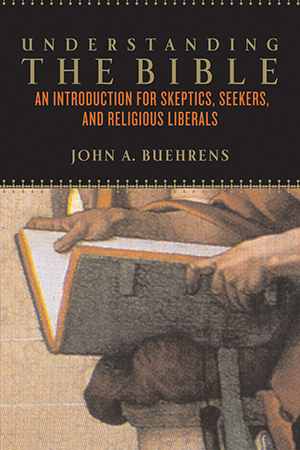 "[Buehrens] demonstrates that it is both intellectually respectable and politically savvy to know your Bible well." "Buehrens offers a comprehensive fairness that genuinely celebrates a diversity of opinions . . . [Understanding the Bible is] a refreshingly articulate introduction that challenges those seeking a higher level of theological education and enlightenment." "An introductory survey of biblical scholarship, [Understanding the Bible] says that you don't have to believe in the supernatural to appreciate the wisdom of the Bible." "[Understanding the Bible] is a readable, salient introduction to biblical study and history." "Buehrens does a masterful job of coursing through both Testaments, placing events and pronouncements in context of both prevailing theology and the times."